John Vearncombe was interviewed by Julian Clegg on his breakfast show on BBC Radio Solent, to talk about his participation in the upcoming Clipper Around the World Yacht Race, which kicks off in a few days from Liverpool. John aims to complete the entire 40,000 nautical mile challenge and is asking members of the public to sponsor each mile for the St George Foundation at £1/mile. Cheer John on in his immense global challenge, and help save another child in need with the St George Foundation. Southampton – 24th July 2017: Sierra Leone street child charity, the St George Foundation is proud to announce that Hampshire resident John Vearncombe has chosen to fundraise for the charity as he takes part in this years round the world Clipper race. The race, which is due to commence on the 20th of August will find the team sailing from Liverpool for the first 5,200 nautical mile leg journey. John and his team will board the Clipper yacht ‘Liverpool’ named after the city itself, which is 1 of 12 identical Clipper racing yachts taking part in this 40,000 nautical mile race around the world. “I started sailing at the age of 28 after moving to Dundee, where I was able to join a local sailing club and fulfil my interest in sailing. It was here that I first came across the Clipper Round the World Race, and so began my journey to be a part of the most gruelling amateur global sea race known to man” said John Vearncombe “As I take part in this once in a lifetime challenge, I want to use my experience to help others. This is why I chose to fundraise for the St George Foundation, asking people to sponsor each mile of my journey where I will dedicate the entire £40,000 sponsorship target to helping the street children of Sierra Leone”. The St George Foundation has been helping homeless orphans from the streets of Sierra Leone since 2004, providing shelter, education, medical care and reconnecting the children with lost family once settled. “We are extremely honoured and grateful to John for choosing the St George Foundation as his charity of choice as he takes on this enormous human endeavour” said St George Foundation Co-Founder, Philip Dean “We desperately need the support of people like John if we are to continue our work to help the hundreds of children left to fend for themselves after the years of civil war in Sierra Leone. We wish him all the best, and will be following him through his blog, as he circumnavigates the globe and achieves each challenging leg”. 15th July - Thank you to everyone who came and supported our St George Foundation charity fundraising Garden Party this Saturday. It was a truly successful and enjoyable day, with huge numbers in attendance from the youngest to those who (like us) are young at heart. We would like to also add our special thanks to Kings Church Bishops Waltham for supporting us with the delicious cakes/cake sale, the volunteers from St Barnabas, Swanmore and Locksheath Free Church, to Brian Pancott for taking some very lovely pictures of the event on the day, and to all those supporters and volunteers without whom our day would not have been possible - Thank you to you all! We hope to see you all again at the next St George Foundation charity event and hope that you will continue to support us to help the hundreds of children in desperate need of our help in Sierra Leone. We've been busy over the last few months continuing our work to help even more homeless children off the streets of Sierra Leone. However, while we have been working hard there, we have also been working hard here. Over the next few weeks, you will see the launch of our brand new St George Foundation website, as well as increased news and events being publicised via our social media channels. Look out for the news, follow us, and please continue to support the work we do each day in Sierra Leone to help the hundreds of children left to fend for themselves without the care or love of their immediate family - something we all very much take for granted. 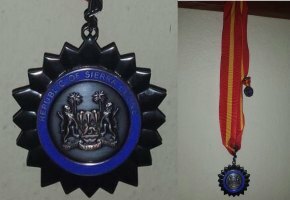 ‘’Give honours to those who honours are due’’ This is the direct quotation of His Excellency, President Ernest Bai Koroma, President of Sierra Leone, during his special award giving ceremony organised for deserving NGOs, INGO, Individuals, private institutions and MDAs at the State House on State Avenue, Freetown. 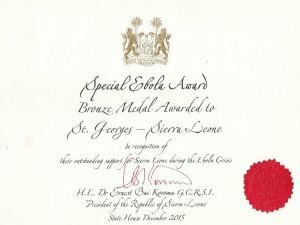 St. George Foundation-SL was one of the NGOs that received the special presidential awards as one of the outstanding organisation that championed the fight against Ebola in Sierra Leone. 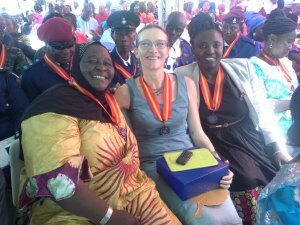 The Director of Ben Hirsch Child Protection on the left and the Executive Director of St. George Foundation, Justina Conteh, on the right with the Sierra Leone Director of GOAL-Ireland in the middle. 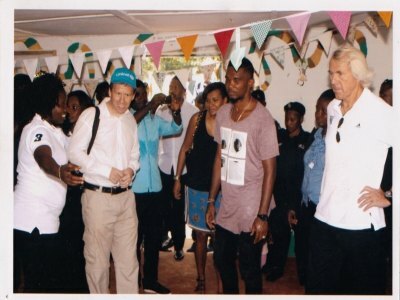 Football superstar Samuel Eto (UNICEF, Goodwill Ambassador) visited the ST George Foundation Interim Care Centre at Grafton, Freetown, Sierra Leone as part of the FIFA Eleven for Health campaign. He was joined by FIFA's Chief Medical Officer Professor JiÅí DvoÅák and President of the Sierra Leone Football Association, Mrs Isha Johansen. They were touring facilities being utilised by Ebola affected children, child survivors and extremely vulnerable children, and our centre was chosen as was one of only two centres accredited by the Sierra Leone government. 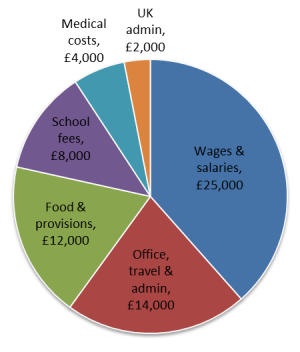 Pie chart showing how the money is spent in each category: only 3% is used for UK admin. See the full breakdown on our latest financial statements.